I don't want to have a completely grown up set of dish ware -ever. Life is too short to be all stuffy and boring. 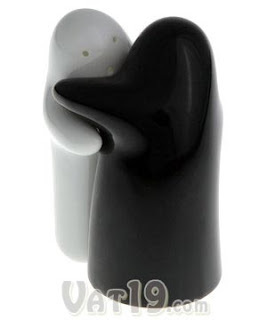 Case in point...these adorable salt & pepper shakers, hugging it out in full view on your dining room table. I love them almost as much as they love each other! Spice up your dining experience, and feel the love!